« Teachers with conservative views don’t make the cut. The roughly $1.5 trillion in student debt is held by about 45 million former students. That works out to about $33,000 per debt holder. Public Colleges: Roughly 2 of every 3 students graduating from a public college leaves with an outstanding loan averaging $25,550. Private Non-Profit Colleges: Roughly 75%students graduating from an NFP private college leaves with a student loan debt that is, on average, $32,300. 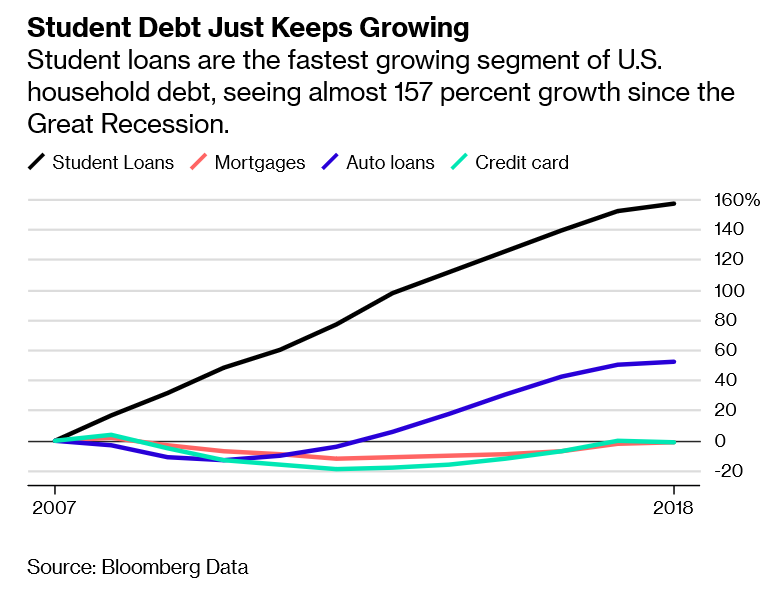 For-Profit Colleges: Roughly 9 in 10 of students who attend for-profit colleges leave with loans that are , on average, $39,950.These ‘for-profit’ borrowers are particularly problematic since they have the largest average debts and — by far — the highest default rates. This entry was posted on April 3, 2019 at 6:59 am and is filed under Student Loans. You can follow any responses to this entry through the RSS 2.0 feed. You can leave a response, or trackback from your own site.